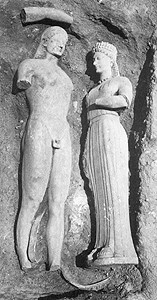 In 1972, a kore of superb condition was excavated alongside a kouros in Merenda (ancient Myrrhinous), Greece (Kakavoyiannis 2007: 332; Svenbro 1993: 9-10). Their unearthing by Evangelos Ch. Kakavoyiannis manifested the statues’ functions, aptly expressing the eternal appearance of the deceased in the living world. Kakavoyiannis further recognized the kore’s relation to an inscribed base housed in Athens that identified her name: Phrasikleia (Kakavoyiannis 2007: 337). This paper examines how, when read together, the figure and base serve as a marker of connectivity and communicate with the worlds of the living, the dead, and the gods. Her reappearance, through archeological excavation, allowed Phrasikleia to speak her eternal voice and be present once more. On May 18, 1972, a kore of high quality and superb condition was excavated beneath a thick grove of olive trees in Merenda (ancient Myrrhinous), Greece (Svenbro 1993: 9-10; Kakavoyiannis 2007: 332). Found alongside an equally well-preserved kouros, the female (kore) and male (kouros) statue figures nearly touched one another in a carefully placed and loving arrangement (Kakavoyiannis 2007: 332) (fig. 1). Scholars suggest that they were grave markers, likely removed from atop their tombs and buried together in a pit as protection from vandalism by political rivals1 (Svenbro 1993: 12). Placed in the earth, like the bodies of the deceased whom they honored, the statues were reborn at the hands of their excavator, Evangelos Ch. Kakavoyiannis, who recalls that local residents “saw them emerging ‘alive’ from the earth that had lovingly protected them for so many centuries” (2007: 332). The resurrection was a fitting imitation of the function and meaning of these Archaic semata2, meant to signify the eternal presence of the deceased in the living world. The exceptional artistic and physical state of both statues confirms the monumental importance of their discovery, but the kore (fig. 2) was a special find (Kakavoyiannis 2007: 337). The excavator immediately recognized the statue’s relation to an inscribed base housed at the Epigraphic Museum in Athens (Stieber 2004: 146; Kakavoyiannis 2007: 337). The base was well-known, having been found nearly 250 years earlier set into a wall at the Church of Panaghia in Myrrhinous, just 200 meters from the site of the 1972 excavation. Here, the base functioned as a capital at the top of an engaged column until it was removed from the church in 1968 (Svenbro 1993: 10; Stieber 2004: 146; Kakavoyiannis 2007: 337). One day after the kore was unearthed, the lead dowel found beside the statue was taken to the museum in Athens and fit into the socket on the base. Like two pieces in a puzzle, they were a perfect match (fig. 3) (Kakavoyiannis 2007: 337). Thus, the kore reunited with its base. The signed inscription identified the name of the sculptor, Aristion of Paros, who scholars subsequently attributed to the kouros as well3. In addition to the artist’s name, the inscription also revealed the kore’s name, Phrasikleia. Reunited with the sculpture, the words of the epigram could be read in their intended context to express a full story. After centuries of silence, the resurrected Phrasikleia regained her voice. What did Phrasikleia say when she reappeared and how did these joined parts, statue and text, operate together and construct speech? As a kore, Phrasikleia functioned as both a sema and an agalma, a grave marker and a votive. These terms had various meanings to the Greeks that changed over time; in the context of this paper, however, I use them to express how the kore communicated after her death with messages meant for the worlds of the living, the dead, and the gods (Benveniste 1932; Vernant 2006: 333-349). In this way, she ties together three essential elements of the Greek oikoumene, or known world, and acts as a point of engagement between them. This paper will focus on the statue’s iconography to discuss Phrasikleia as a marker of connectivity between life and afterlife and the topographic relationship between those physical and temporal worlds. Before we address Phrasikleia as an intact funerary sculpture, we should consider her among other sculptures of her type. The formal qualities of korai remained consistent for nearly 200 years during the Archaic period (c. 750-500 BCE) (Richter 1988: 1; Sourvinou-Inwood 1995: 241-243). The figures convey minimal expression in their faces and gestures. Their arms and hands are by their sides or at the chest, or one might hold offerings while the other hangs or grasps her drapery. By the end of the sixth century, changes in drapery began to reveal the soft flesh beneath it and greater attention was paid to facial features, arrangement of the hair, and ornamentation. 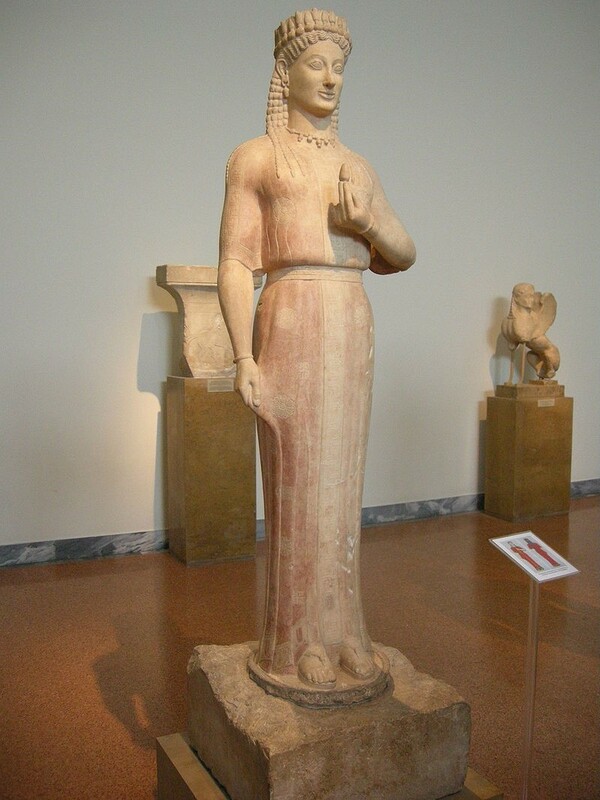 Dated c. 540 BCE, Phrasikleia is a nearly life-sized standing figure of a richly ornamented young woman. Her neutral, generic expression and hallmark smile of the period reveal little information about young Phrasikleia, making the existence of her inscribed base extraordinarily valuable for scholarly analysis. In certain sanctuary contexts, such as the Acropolis at Athens, the kourai and, less often, their male counterparts, kouroi, acted as offerings. The word “agalma” refers to a votive statue, a suitable use of a term that also means “glory, delight, and honor,” or “a pleasing gift” (Richter 1988: 1). Their erect poses announce their presence and the gestures of their hands and arms convey gratitude and offerings to the divine (Richter 1988: 3-4). More often, however, scholars discuss the statues’ function as aristocratic grave markers. During the Archaic period, noble families erected elaborate funerary arrangements over their burial plots as places of mourning, as well as to attract attention to their deceased kin (Humphreys 1980). After a body was interred, its tomb was denoted by a monument, called a “sema”, literally a sign, but also a bearer of information of the deceased. The sema indicated the presence of the buried person’s remains beneath the tomb or mound, but also acted as a marker of their absence. Death removed them from the living world, but the sema could relocate and reestablish a space for their physical presence. The sema could also carry symbolic, coded meanings about the deceased as it sparked a memory of the person in the individuals who knew him or her, or in the collective and continued memory of a community. In this way, the sema functioned as a marker of connectivity between the living and the dead. Through the rituals of death, the body was closed off and sealed away, but in its function as a sign, the grave monument could reactivate the presence of the deceased in the world of the living (Sourvinou-Inwood 1995: 112-122)4.
having received this name from the gods instead of marriage (1993: 17). With our understanding of the term sema, we can establish that in the first line, the grave marker announces itself as the sign of a girl named Phrasikleia. She tells us that she will always be a girl, that is, an unmarried virgin, a name bestowed upon her by the gods. Is her status of maidenhood an honor? Does she receive an agalma from the gods while also functioning as an offering to the Gods? What might this imply about her identity in life and in death? To answer these questions, we can make use of Svenbro’s careful semiotic analysis. The viewer of Phrasikleia must also be the reader of her epigram, speaking the words of the inscription and reading its associations in her figure. For Svenbro, the spoken word enlivens the statue and communicates her function. He argues that to understand the association between inscription and statue, however, we must first understand the mechanics of reading and the identity of voice in Ancient Greece. Reading, by definition, was oral and the act of reading aloud an inscription, like Phrasikleia’s, was inherent to its function. To explain the roles of the reader and writer, Svenbro draws comparison to Foucault’s analysis of pederasty, the relationship between the older, dominant male lover and his younger, submissive male beloved (1993: 2). The reader is the beloved, making himself available to the written word and therefore deposed by the writer, the lover (Svenbro 1993: 2-3). At the same time, however, the writer and the reader, the lover and the beloved, are mutually dependent on their relationship to one another to fulfill these roles. The reader gives voice to the written word, essentially taking the place of the “absent writer” and thereby, the reader’s voice is not his own but is the vehicle or instrument through which the writer may speak (Svenbro 1993: 3-5)5. Applying this theory to funerary sculpture, the inscription, when read aloud, is not spoken in the voice of the reader, but in the voice of the statue bearing that inscription. That voice belongs to Phrasikleia and Svenbro’s analysis further provides a deconstruction of her name. The term “kléos” is associated with sound or acoustics and means “fame” or “resounding renown” and a derivative of that word appears in Phrasikleia’s name (Svenbro 1993: 4, 12-15). The notions of memory associated with sema are, therefore, inherent in the name of the deceased. Svenbro explains that “kléos” was of particular importance to the Alcmaeonid family to which Phrasikleia belonged, many of whose members had names that derived from that word (1993: 12-13). The first part of her name is derived from the verb “phrázein”, which means “to show” or “to draw attention to,” suggesting that her overall name functions to draw the reader’s attention to her fame or, more appropriately, to her family’s fame (Svenbro 1993: 14-17). The Alcmaeonids were expelled from Athens in the mid sixth century, causing fear that the family’s tomb and funerary sculptures may be vulnerable to attack (Svenbro 1993: 12-13). Phrasikleia’s connection to these political circumstances adds even greater value to the work and its story, while also providing a theory for the deliberate burial of the kore and “her brother,” the kouros found with her (Svenbro 1993: 22; Kakavoyiannis 2007: 332)6. Phrasikleia’s need to draw attention to her family and assert their fame is also inherent in the reading of her epigram. Phrasikleia “shall always be called girl” because she has died an unmarried virgin and, therefore, has not supplied her family with heirs (Svenbro 1993: 20-22). To understand fully the implication of her unwed status, we must transfer our attention from the spoken reading of the epigram to the silent reading of the visual sign in her sculpted form, specifically the closed lotus flower held in front of her chest (Svenbro 1993: 20-21). According to Svenbro, the lotus is a metaphor for the fire in the hearth; able to regenerate, it opens as a fire is “rekindled” in the morning and closes like a fire will “die down” at night (1993: 21). The continuous burning of a fire in the hearth symbolizes a family’s ancestral endurance (Svenbro 1993: 22). The kouros figure found with Phrasikleia was possibly her brother, who perhaps also died in youth and was buried at the family tomb. A generation together in death, it seems that the fire is snuffed, the family line broken, the fame silenced. But Phrasikleia provides hope for renewal as she fulfills the duty to her family that she risked denying them in death. The audible reading manifests “kléos”, the silent reading opens the closed lotus, and Phrasikleia returns from the afterlife with renewed voice at her sema, the marker of connectivity between the worlds of the living and dead. The lotus is Svenbro’s only reference to the kore in an analysis that otherwise focuses on the written epigram. Mary Stieber provides a necessary balance to the discourse in her 2004 book, The Poetics of Appearance in the Attic Korai. Stieber’s comprehensive formal analysis offers what she calls “the visual semiotics” and “semiotics of appearance” in contrast to the emphasis by Svenbro and others on “the verbal semiotics of the inscription” (Stieber 2004: 151). Just as Svenbro reads Phrasikleia by deconstructing her epigram, Stieber reads the kore by reviewing her decorative attributes. She explains that the lotus flower held in her fingertips, the buds in her crown, and incised blossoms on her garment, are references to the activity of flower gathering that Phrasikleia would have performed as a young girl (Stieber 2004: 151-152). The Archaic Greek viewer would understand this association between flower gathering and a parthenos (a beautiful girl or virgin), as opposed to a gyne (a married women) (Sourvinou-Inwood 1995: 249). Once gathered, the flowers might be formed into garlands, like the one on her head, or used to dye yarns and textiles, demonstrated by the patterns on her dress (Stieber 2004: 151). She is, therefore, a maiden and connected to her role in the world of the living. The poem describes Persephone engaged in the same activities in life as any other kore; therefore, by extension, the kore must also follow Persephone’s lead in death. The flowers decorating Phrasikleia, specifically the buds on her necklace and hair, could be interpreted as pomegranate blossoms, a suitable association with Persephone. Demeter refuses to return to Olympus or to allow spring to bloom on the earth until her daughter’s return. Zeus then sends Hermes to the Underworld to retrieve Persephone. Hades agrees to let her go, but then tricks her: “But he on his part secretly gave her sweet pomegranate seed to eat, taking care for himself that she might not remain continually with grave, dark-robed Demeter” (Anonymous 1914: 371-372). His trick is revealed when Persephone returns to Demeter and her mother explains the pomegranate’s harm7. Persephone realizes Hades’ deceit and tells her mother “he secretly put in my mouth sweet food, a pomegranate seed, and forced me to taste against my will” (Anonymous 1994: 412-413). Hence, the pomegranate becomes an attribute of the young goddess and its appearance adorning korai associate those figures with her narrative. Turning again to the epigram, we find this association to Persephone in the text as well, indicating how statue and text work together in a combined audible and silent reading. Svenbro and Stieber both translate the word kore as “girl” and suggest alternate translations as “daughter” and “virgin,” emphasizing her status in the family as an unmarried maiden (Svenbro 1993: 18-19). As a name, however, Kore refers to the deity Persephone. The conflation of the name for goddess and girl suggests these grave markers for young maidens reenact Persephone’s narrative. Women who died before marriage had a special status among the dead, just as a woman’s virginity, or lack of virginity, was essential to her identity and role in society (Lefkowitz 2007: 42-43). A young woman who died unmarried still found marriage in the afterlife as a bride of Hades (Stieber 2004: 249-250). Stolen away to the Underworld too soon, she became part of Persephone’s entourage of attendants, connected to the story of the goddess and forever reenacting her marriage to Hades. Here again we see the role of sema as marker of connectivity; Phrasikleia and other korai like her assimilate to Persephone and make clear the co-existent nature of the worlds of the dead, living, and gods. Straddling the boundary between life and death, Phrasikleia travels between the realms of the living and the dead as demanded by the duty to her mortal family and the circumstances of her marriage to Hades. How did she travel between these separate yet co-existent worlds? A bell-krater by the Persephone Painter at the Metropolitan Museum of Art (fig. 4), dated c. 440 BCE, depicts Persephone rising from a rocky cavern, her bent left knee capturing the upward motion of her ascension. Hermes, wearing his traveler’s hat and carrying his staff, guides her out of the ground and Hekate carries two torches to light her path. Her mother, Demeter, awaits her arrival on the opposite side of the composition. Her return involves an upward climb and she has gathered her drapery in her left hand for surer footing (Richter 1931: 246). Turning again to Phrasikleia, we note the position of her right hand, holding the side of her dress and revealing her prominently sandaled feet. She appears to us at the moment of ascent, drapery still in hand and feet still positioned for motion, reappearing to pronounce her epigram. Fig 4. Attributed to the Persephone Painter, Terracotta bell-krater, c. 440 BCE, terracotta, 41 cm; diameter of mouth 45.4 cm, Metropolitan Museum of Art. Source: Metropolitan Museum of Art (2017). [Online], http://www.metmuseum.org/art/collection/search/252973. The iconography of the Met’s bell-krater introduces the notion of the Underworld as a separate, physical space but one connected to the living world. To understand Phrasikleia’s role as a marker of connectivity, we need to address how the dead and the living related to one another in the Greek conception of their world. What was the Greek understanding of the Underworld as a location in the oikoumene? Where does Hades actually take Persephone and how does this relate to Phrasikleia’s fate as his bride in the afterlife? The Homeric Hymn to Demeter provides clues that chart Persephone’s descent into the earth. After she picks the narcissus, “the wide-pathed earth yawned there in the plain of Nysa, and the lord, Host of Many, with his immortal horses sprang out upon her” (Anonymous 1914: 2:15-18). The Hymn goes on to record Hekate’s description of Persephone’s abduction to Demeter, saying that Hades “took her loudly crying in his chariot down to his realm of mist and gloom” (Anonymous 1914: 2:81), again referencing the descent of their journey into the earth. The Underworld is also described as “the hidden places of the earth,” “beneath the secret places of the earth,” and “beneath the depths of the earth” in lines that suggest the afterlife’s location within or connected to earth beneath the feet of the world of the living. The burial of the deceased makes use of this direct connectivity. The reference to Persephone’s ascent on the Met’s bell-krater conforms to other visual representations that suggest the afterlife’s location beneath the world of the living, based on descriptions in literary sources. In book eleven of Homer’s Odyssey (1996), Odysseus ventures to the Underworld to find the ghost of the seer Tiresias. He must first sail to the dark edge of the river Ocean, suggesting that the realm of Hades may be reached at a location past Ocean’s boundary of the oikoumene. Homer’s description of the physical location of the Underworld does not end, however, when Odysseus reaches its shore. He references the ascension of the ghostly figures drawn to Odysseus saying, “and up out of Erebus they came” (Homer 1996: 41). A red-figure pelike8 (fig. 5), dated c. 440 BCE, in the collection of the Museum of Fine Arts, Boston, depicts Odysseus in such an encounter, approached by his deceased crewmember, Elpenor. Like Persephone on the Met’s bell-krater (fig. 4), Elpenor rises upward from unseen depths. His lower legs and feet are missing, still sub-merged in the darkness below. Odysseus did not travel to the subterranean depths of the Underworld, but merely to its entry point at the border between the worlds of the living and dead. Past that gate, the dead descend into a deeper realm of death. Fig 5. 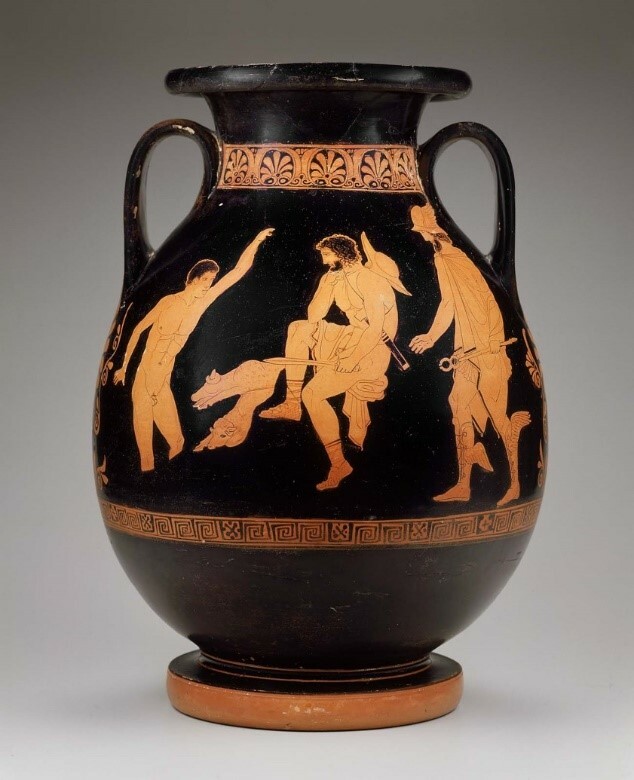 Attributed to the Lykaon Painter, Jar (pelike) with Odysseus and Elpenor in the Underworld, c. 440 BCE, ceramic, 47.4 cm x 34.3 cm, Museum of Fine Arts, Boston. Source: Museum of Fine Arts of Boston (2017). 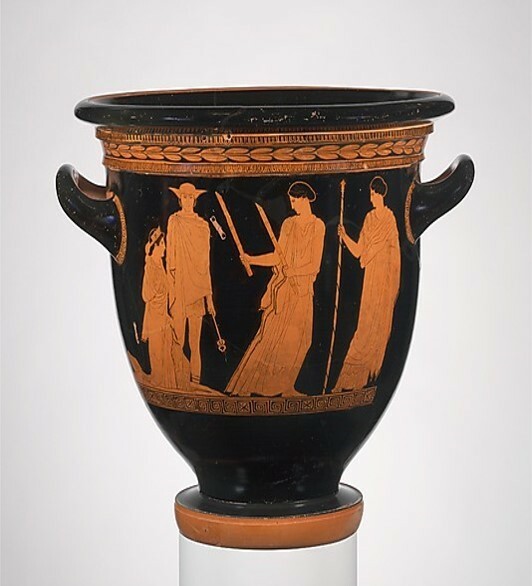 [Online], http://www.mfa.org/collections/object/jar-pelike-with-odysseus-and-elpenor-in-the-underworld-153840. The Underworld’s location relative to the river Ocean draws our attention to geography. Though subterranean, Hades could also be reached by traveling west, crossing Ocean to access the entrance to Earth’s underlying level (Sourvinou-Inwood 1995: 60). In this way, Ocean served as a boundary between the worlds of the living and dead (Sourvinou-Inwood 1995: 62). Though figures of myth might cross back and forth over this line, it was understood that a mortal being could only make a single trip. 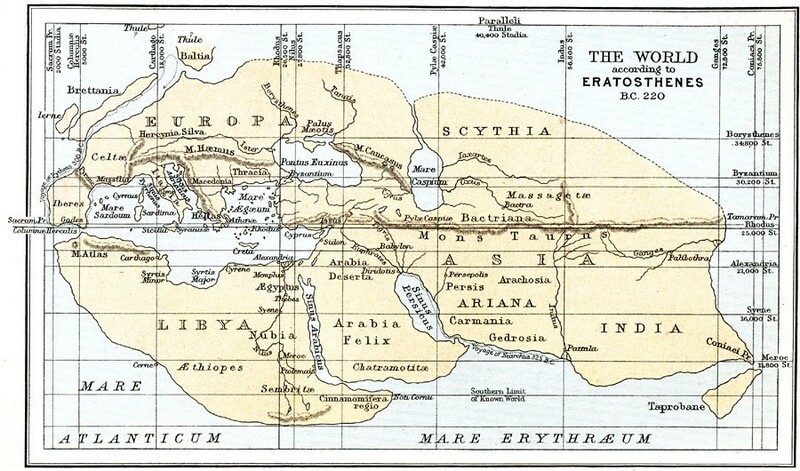 Nevertheless, the encompassing nature of Ocean, demonstrated by a map of the oikoumene drawn after Eratosthenes’ third-century geography (fig. 6), suggests its powerful influence on the Greek concept of the living world’s geography and its implications for the world of the dead. The Underworld’s relationship to the living world was not only geographical but also temporal. In his book The Edges of the Earth in Ancient Thought (1992), James Romm explains that “Ocean could represent the outer limits of both geographic space and historical time at once, a combination which inspired equal measures of fear, fascination, and reverence” (1992: 26). This amalgamation of space and time established boundaries between the known, civilized world, and the mysterious, remote world. As Romm explains, far distances were associated with travel in time, a notion that explained the presumed primitivism of peoples living the furthest away from Hellas (Greece) (1992: 46-49). This association extends beyond geography and mapping, however, to convey attitudes associated with mortality and afterlife. Understandings of geographical and temporal distance blurred the boundaries between the ordered worlds of the dead and the living. Mortality is inevitably linked to time, while the location of the afterlife is associated with geographic distance. The uncertainty of the Underworld’s precise location suggests its presence at the edge of Ocean in any distant direction. At those far away, mysterious distances, the Underworld may possess its timeless, eternal quality and the souls of the dead from separate generations can gather simultaneously. At the time of her death and after her body was sealed in its tomb, Phrasikleia’s shade would have traveled to this timeless, distant underworld to take up her mantle as the bride of Hades. Despite this disappearance, her special status as an unwed maiden granted her privileged access to the living after her death, as communicated by the statue and text of her grave marker. As an intact kore, Phrasikleia offers a rare opportunity to study an Archaic grave monument as a complete presentation of statue and text. Her spoken epigram gives her voice that, when considered in union with her rich iconography, conveys her functions as both a grave marker and a marker of connectivity. She communicates the fame of her family and restores the endurance of their ancestry. She communicates with the dead to accept her role as bride of Hades. And she communicates with the gods in her association with Persephone and her function as agalma. Through disappearance and appearance, Phrasikleia represents the essential connections between life, afterlife, and divinity in the Greek conception of their oikoumene. Her unearthing in 1972 reasserted these networks and allowed Phrasikleia’s eternal voice to reappear and speak her name. Svenbro credits Carl Nylander with this information regarding the sculpture’s condition and 6th century burial. I use the terms semata (sing. sema) and agalma throughout this paper but with limited discussion of semantics. The statues could be discussed as types of kolossoi, erected figures of human subjects; but this paper uses kouros and kore, the terminology generally associated with ancient Greek funerary sculptures. Scholarship related to the multivalent and changing terminology includes the following: Benveniste (1932); Dickie (1996); Vernant (2006: 333-349). Kakavoyiannis explains that Aristion of Paros signed the base of the kore figure, which is used as evidence to attribute both figures to the artist. Sourvinou-Inwood provides the information regarding “sema” presented in this paragraph. Svenbro tells us that writing obliges a voice and that “letters were meaningless for the average Greek reader until they were spoken. Letters had to be pronounced aloud if the text was to become intelligible” (1993: 4). Only by hearing the words could the reader, who was also the audience, recognize their meaning because “the letters themselves did not represent a voice” (Svenbro 1993: 4-5). Writing could not represent a voice until reading was a silent activity and the letters came to operate on their own, without an intermediary to voice them to the reader. The words became self-empowered, no longer relying upon oration to give them substance. According to Svenbro, this shift to silent reading occurred in the late sixth century at the earliest, a date remarkably close to the suggested date of Phrasikleia, c. 540 BCE. Though Svenbro argues for the audible reading of her epigram, his reference to the association between word and figure would have relied on a silent reading as well. Sculpted relatively near this time of shift from audible to inaudible reading, I posit that Phrasikleia is poised to demonstrate the power of both methods. 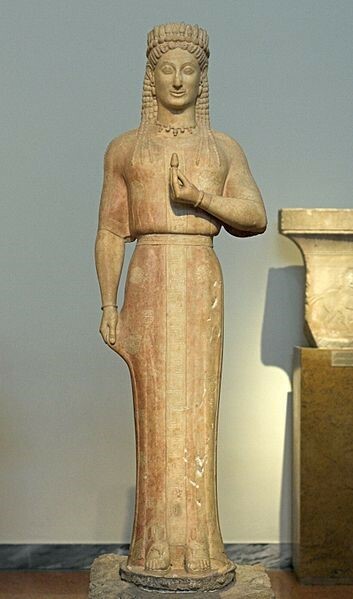 Kakavoyiannis notes that locals called the kouros “her brother” when they were excavated (2007: 332). Svenbro does not mention the kouros and, by contrast, suggests, “We do not know whether Phrasikleia had any brothers” (1993: 22). “My child, tell me, surely you have not tasted any food while you were below? Speak out and hide nothing but let us both know. For if you have not, you shall come back from loathly Hades and live with me and your father, the dark-clouded Son of Cronos and he honored by all the deathless gods; but if you have tasted food, you must go back again beneath the secret places of the earth, there to dwell a third part of the seasons every year: yet for the two parts you shall be with me and the other deathless gods” (Anonymous 1914: 393-400). A pelike is a type of ceramic amphora, or storage vessel, used to hold wine or water. Its distinct shape is formed by a wide mouth, narrow neck, and broad base. The scene decorating the MFA, Boston’s pelike demonstrates the red-figure technique of ancient Greek painting, meaning the figures are outlined and their details painted in black but left in the red color of the clay, while the background is painted in a solid black color. Anonymous. 1914. “The Homeric Hymn to Aphrodite” and “The Homeric Hymn to Demeter”. In The Homeric Hymns and Homerica. Translated by Hugh G. Evelyn-White Cambridge, MA: Harvard University Press. Baumbach, Manuel, Andrej Petrovic and Ivana Petrovic. 2010. Archaic and Classical Greek Epigram. Cambridge: Cambridge University Press. Benveniste, Émile. 1932. “Le sens du mot kolossos et les noms grecs de la statue.” Revue de Philologie, de Littérature et d’Histoire Anciennes 6: 118-135. Dickie, Matthew. 1996. “What is a kolossos and how were kolossoi made in the Hellenistic period?” Greek Roman and Byzantine Studies 37, no. 3: 237-257. Dova, Stamatia. 2012. Greek Heroes in and out of Hades. Lanham, MD: Lexington Books. Garland, Robert. 1985. The Greek Way of Death. Ithaca: Cornell University Press. Greene, William C. 1946. “The Return of Persephone.” Classical Philology 41, no. 2 (April): 105-107. Homer. 1996. The Odyssey. Translated by Robert Fagles. New York: Viking. Hornblower, Simon and Anthony Spawforth. 1996. “Demeter,” “Hades,” “Persephone.” Oxford Classical Dictionary, 447-448, 661-662, 1142- 1143. Oxford: Oxford University Press. Humphreys, S. C. 1980. “Family Tombs and Tomb Cult in Ancient Athens: Tradition or Traditionalism?” The Journal of Hellenic Studies 100: 96-126. Kakavoyiannis, Evangelos Ch. 2007. “Memories of Phrasikleia.” In Great Moments in Greek Archaeology, edited by Panos D. Valavanis, 332-337. Los Angeles: The J. Paul Getty Museum. Lefkowitz, Mary R. 2007. Women in Greek Myth. Baltimore: John Hopkins University. Liddell, Henry George and Robert Scott. 1940. A Greek-English Lexicon. Revised and augmented throughout by Sir Henry Stuart Jones with the assistance of Roderick McKenzie. Oxford: Clarendon Press. Mackie, Hilary. 1995. “Review: Phrasikleia. An Anthropology of Reading in Ancient Greece by Jesper Svenbro.” Language in Society 24, no. 2 (June): 288-291. Pollitt, J. J. 1972. Art and Experience in Classical Greece. Cambridge: Cambridge University Press. Pollitt, J. J. 1990. The Art of Ancient Greece: Sources and Documents. Cambridge: Cambridge University Press. Richter, Gisela Marie Augusta. 1931. “An Athenian Vase with the Return of Persephone.” The Metropolitan Museum of Art Bulletin 26, no.10 (October): 245-248. Richter, Gisela Marie Augusta. 1988. Korai: Archaic Greek Maidens. New York: Hacker Art Books. Ridgway, Brunilde Sismondo. 1982. “Of Kouroi and Korai: Attic Variety.” Hesperia Supplements, Studies in Athenian Architecture, Sculpture and Topography. Presented to Homer A. Thompson 20: 118-127, 209. Ridgway, Brunilde Sismondo. 1984. “The Fashion of the Elsin Kore.” The J. Paul Getty Museum Journal 12: 29-58. Ridgway, Brunilde Sismondo. 1993. The Archaic Style in Greek Sculpture. 2nd ed. Chicago: Ares. Shapiro, H. A. 1991. “The Iconography of Mourning in Athenian Art.” American Journal of Archaeology 95, no. 4 (October): 629-656. Sourvinou-Inwood, Christiane. 1995. ‘Reading’ Greek Death: to the End of the Classical Period, Oxford: Oxford University Press. Stieber, Mary. 2004. The Poetics of Appearance in the Attic Korai. Austin: University of Texas Press. Svenbro, Jesper. 1993. Phrasikleia: An Anthropology of Reading in Ancient Greece. Translated by Janet Lloyd. Ithaca: Cornell University Press. Vernant, Jean-Pierre. 2006. Myth and Thought among the Greeks. New York: Zone Books. Whitley, James. 1995. “Review: Phrasikleia. An Anthropology of Reading in Ancient Greece by Jesper Svenbro.” The Classical Review, New Series 45, no.1: 54-55. I successfully completed my qualifying exams for Boston University’s doctoral program in the History of Art and am currently writing my dissertation prospectus. My research will focus on the Florentine tradition of Last Supper refectory paintings with particular interest in Domenico Ghirlandaio's late fifteenth-century frescoes at Ognissanti and San Marco. I have enjoyed teaching Italian Renaissance Art to students at both Boston University and Boston College while also working as the Research Associate for the Curatorial Division at the Museum of Fine Arts, Boston.